If you follow me on Twitter or have spoken to me in real life in recent weeks then you will have probably become bored of my incessant lusting over these Daisy Street Sequin Leggings. Ever since I saw their PR superstar Ellanora wearing them at the Manchester Event a few weeks ago I have needed them in my life. Luckily Santa dropped them out of his sack for me and alas they are my new favourite garment in the world ever. Is that an exaggeration? Probably, but move over Disco pants, you’re not going to be anyone’s favourite shiny leg wear in 2013 any more. 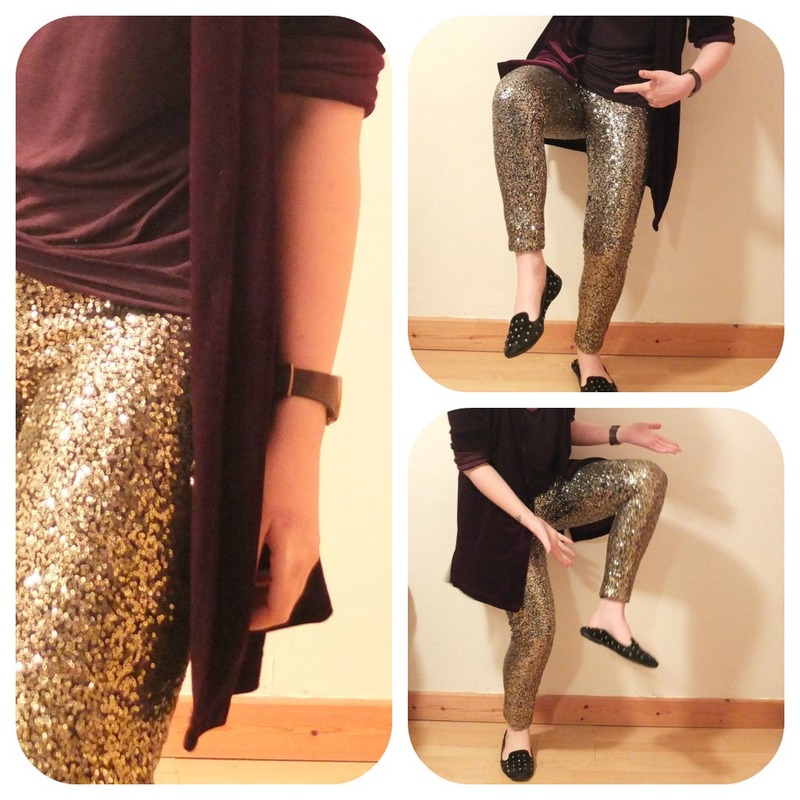 Because these leggings are a little bit on the sparkly side, I didn’t really know what to team them with at first. It was clearly going to have to be something pretty plain though as they’re so eye catching. I thought a plain black top would be best and as they’re so flattering I could even get away with just a short T Shirt too! This never happens!!! 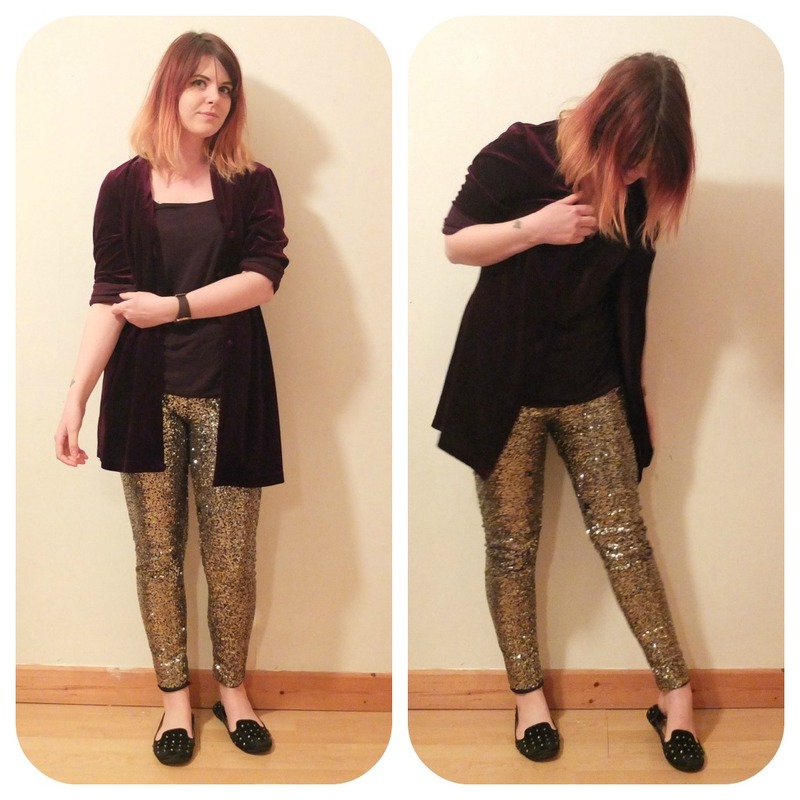 As it’s a bit nippy out I cracked out my new velvet blazer which I picked up at the Charity Shops the other day. It’s so lovely to wear and the exact thing I was after but couldn’t find in any high street shops, it’s a beautiful deep wine/purpley shade and I love how it hangs over my bottom, ha! I have been really precious about these leggings though as the sequins do actually tend to malt. I’ve only worn them twice and already they’re developing a few ‘bald patches’ which is a same, but I figure as they’re pretty much only going to be worn for parties/going out they will still last me a while, although I’m tempted to get a back up pair I love them so much!! As I also mentioned on Twitter, I’m also going to be toning down the beauty side of the blog. What started off as a craft and food blog has become something of a dreary same old same old make up and skin care thing – and I don’t like it!! Obviously I will be featuring products still but going to attempt to find the right balance a bit more with the variation of posts going on, maybe put that crafts degree to good use too with some tutorials or something eh?! Who knows. Tomorrow I officially start my new job as a PR Assistant, I would never have dreamed that using my Twitter and Blog would open up opportunities like this for me, this time last year I was gearing up to start my new job in a Childrens Residential Home in the hope of becoming a teacher! Just goes to show, sometimes having no plan in life is the best plan. Hope you’re enjoying 2013 so far cool cats! Previous Post Screw the Sales, Hit the Charity Shops.